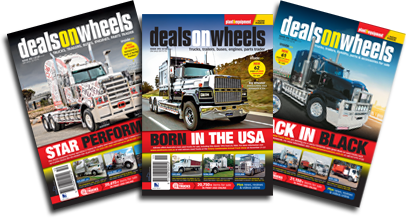 Deals on Wheels is Australia's biggest trucking magazine selling everything from new and used trucks and trailers to parts and accessories. Known in the industry as "The Bible", Deals On Wheels is the proven buying and selling place for the heavy vehicle transport industry. Deals on Wheels: The online truck buyers bible. TradeTrucks: The home of buying and selling trucks online. WHY PLACE YOUR AD WITH TRADETRUCKS? Your ad appears in Australia's leading truck classifieds magazine. Reach buyers on the go. Your truck appears on our mobile-friendly devices. List from as low as $30, no matter how expensive the truck. Attract buyers: Showcase your truck with unlimited photos. Promote your truck on Youtube with our video functionality.